Have you heard of pickleball? Probably not! But it's getting big, so NBC Washington has a guide for what you need to know about this new phenomenon. 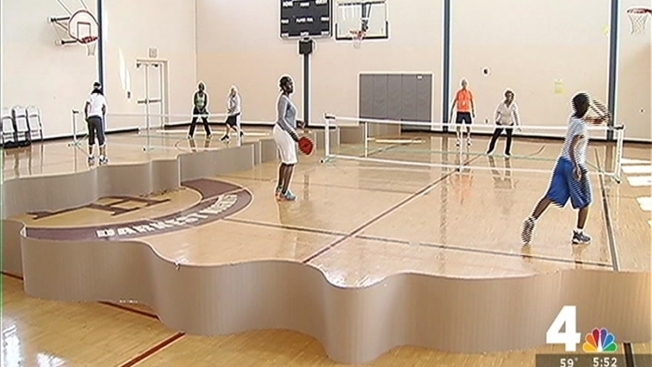 Pickleball is a game that News4's Jim Handly compares to tennis, badminton, racquetball and ping-pong. You can play alone or with a partner -- but you need a court, a paddle, a ball and an opponent to play. Pickleball has its own special set of equipment: The court is the size of a badminton court; the paddle has a short handle and the ball is similar to a wiffle ball. The sport began as a casual backyard game, but it caught on. It has its own association, the USA Pickleball Association, and there are even national pickleball tournaments. Pickleball starts when the serving side hits the ball across the net and it bounces on the opposite side. Then players hit the ball back and forth --- but only the serving side can score. The USA Pickleball Association has a summary of all the rules and a short video explaining how to play. King Greenleaf Recreation Center (201 N St. SW) from 10:30 a.m. to 1:30 p.m. every Tuesday. Emery Recreation Center (5701 Georgia Ave. NW) from 10:30 a.m. to 1 p.m. every Wednesday. Sherwood Recreation Center (640 10th St. NE) from 1 to 3 p.m. every Thursday. The USA Pickleball Association website also lists 60 places in Maryland and 116 places in Virginia where you can get your pickleball on. Since pickleball is played on a compact court, it's great for older people or people who do not like running around a lot. It is still really active, though, so it is great for anyone who would like a sport that only requires a little bit of athletic ability.